Gold vs Bitcoin: Can Bitcoin Replace Gold as an Asset Investment? Gold vs. Bitcoin: Can Bitcoin Replace Gold as an Asset Investment? Home » Analysis and Predictions 2019 » Gold vs. Bitcoin: Can Bitcoin Replace Gold as an Asset Investment? Bitcoin has enjoyed such a run over the past few months that you’d think the alchemists of the Middle Ages were right. Apparently, gold can be created. Or better. Even after losing some 40% off its December peak at near $20,000, Bitcoin is still valued at around $11,000. Rumors have already spread about Bitcoin acquiring a “reserve currency status.” But, why stop there? Before the concept of reserve currency became the norm in global finance and economics, it was gold that determined the value of everything. In many ways, gold retains that “reserve” characteristic; while fiat money is the norm, it has only been so since 1971. That’s when President Richard Nixon broke up the relationship between gold and the dollar. 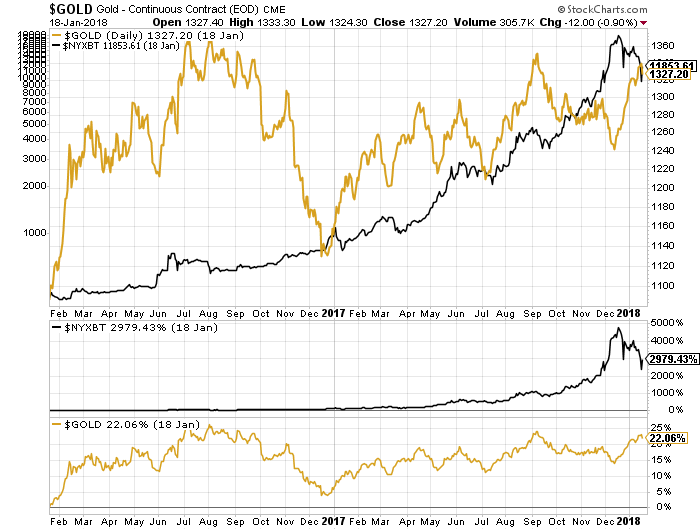 Yet, gold has remained the asset of choice to hedge investors from bearish markets and currencies. Looking at a gold vs. Bitcoin chart for the past year, there’s a striking pattern. Gold and Bitcoin have moved higher harmoniously. It suggests they respond in similar ways to the same risks. The main risk at the start of 2017 was President Donald Trump. The big analysts from their Wall Street towers expected major volatility. Instead, Trump delivered the biggest bull market run in recent memory. The Dow Jones gained some 25%. But many investors remain wary. A shadow of impeachment hangs over the Trump White House amid growing international tensions and uncertainties. The best way to describe Trump’s modus operandi is unpredictability. He may not have “drained the swamp,” but he’s radically changed the “look” of the presidency. Even the tax cuts that have contributed so much to extending the bull run contain within them a major risk: social implosion. That would certainly explain why gold has kept its value, exceeding expectations. Until last October, it also explains why Bitcoin and other cryptocurrencies were becoming popular. Investors wanted to ensure they had good substitutes just like a hockey coach during a playoff match. But, as the gold vs. Bitcoin market cap numbers show, something happened in November that altered the pattern. Call it Bitcoin-mania or a Bitcoin craze if you wish. I call it the Bitcoin bubble. I’m merely one of many analysts who were skeptical about Bitcoin and cryptocurrencies at first, only to become downright opposed to them. Simply put, cryptocurrencies are values built on air. There’s nothing of value. They are simply based on what a group of people decide to pay for them. Groupthink rarely produces anything of value. The problem with bubbles is that those who are living in them refuse to acknowledge the phenomenon. They only do so after the bubble implodes or explodes—it’s all a matter of how quickly the sentiment goes sour. The skeptics can only observe and try to persuade. It’s a thankless and difficult task. Still, if you have any doubts—about whether to be bullish or bearish on cryptocurrencies—ask yourself a simple question: How much return, in a good year, can you reasonably expect when you invest $100.00 or $1,000 or any other amount in a respected stock on Wall Street or any recognized exchange around the world? Sometimes, you could gain 20%. But those are the result of a combination of exceptional circumstances and exceptional stocks. Normally, you can expect seven- or eight-percent returns, 10% if you’re lucky. Note that behind the stock, there’s an actual company. It has employees, valuable assets, patents, intellectual property, inventory, and a market for its goods. Bitcoins, meanwhile, have nothing to back them up. Bitcoin is not a stock and it’s not really a currency. How could it be a currency that people use when its value can change 20% in a day and 40% in a week? Even Germany in the hyperinflation heydays between 1918 and 1924 had a more stable currency than that. For a more current comparison, the Venezuelan bolívar offers better guarantees than cryptocurrencies. Perhaps, Bitcoin’s success—and the cryptocurrency trend it has spawned—owes to the “Occupy Wall Street” movement and the financial crisis of 2008. Many have become disenchanted with stocks and the financial markets, and justifiably so. I don’t blame them. Indeed, I sympathize with them and share their concerns. For instance, the current bull market is heading toward a disaster. But if they wanted an alternative, all they had to do was look to their jewelry boxes. Most likely, they would have found there a reminder of the alternative, or the hedge to stock market vagaries: gold. Evidently, many investors, particularly younger ones, see Bitcoin as the new gold. And that’s where the gold and Bitcoin comparison starts—and where it ends. Cryptocurrencies appeal to “millennials” and those who’ve listened to Jimmy Durante’s Young at Heart one too many times. After all, that lovely song does begin with “Fairy tales can come true.” Those same millennials don’t like gold. It’s for rich, old, conservative people. It’s not cool. Bitcoin, on the other hand, is the coolest. It’s like, totally crypto, man. The appeal of Bitcoin is its space-age/cyber-age technology. Yet, that technology depends on power; good old-fashioned electricity. Bitcoins are virtual, for lack of a better term, things. Many associate them with an image of what looks like a gold coin with a big “B” in the middle. Rather, without electricity, you can’t use your Bitcoin wallet to buy anything. After a nuclear war, for example—and given the geopolitical risks in 2018, nobody can rule one out—bitcoins will have zero value. The “jewelry” bitcoins, gold or silver or even steel renditions of the Bitcoin image, will have more value than the bitcoins themselves. Perhaps, many of the new Bitcoin investors—who probably have no clue on what they’re spending their actual and hard-earned currencies—think they’ve bought a chunk of the Bitcoin coins? The appeal of Bitcoin, after all, is that it slips through rules and authority. That makes Bitcoin very much unlike gold, which takes up space in vaults and safes to be stored. The fact that cryptocurrencies slip by the authorities is why criminals—and any entity with subversive ends, including some governments or government agencies—appreciate them. Nevertheless, this very characteristic and apparent advantage of cryptocurrencies is what will increasingly make them more vulnerable. That’s the opposite of gold. Among other things—starting with a sudden dose of reality raining down on the Bitcoin parade—one of the main drivers of cryptocurrency volatility is their use in criminal enterprises. The other is that governments, which still exercise considerable vigilance over their citizens’ financial activities, are wary of allowing them to evade controls through something like Bitcoin. It’s unfortunate that China should be one of those governments. After all, by 2050, if not sooner, China could be the world’s leading economy. In addition, “communist” or not, the Chinese have taken to investing like Sichuan green beans to soy sauce. The halt on cryptocurrency trading in South Korea suggests that regulatory concerns also exist in democracies. Who’s to suggest that the United States or the European Union won’t start taking a closer look at cryptocurrencies? South Korea’s legal musings have forced Bitcoin to drop by almost 20%. It fell below $10.0 and then recovered. But it failed to establish the kind of credibility—or stability, if you will—it needs to replace gold. The difference in the gold and Bitcoin price, moreover, can be witnessed should you take a gold bracelet to the pawnbroker during a blackout. The bracelet, no matter how ugly or beautiful the workmanship, will have a value based on its gold content. The bitcoin will be less than zero. It won’t have any value. The more cryptocurrencies increase in value, the more investors should be wary. The regulatory authorities, and not just in China or Korea, will start to take a closer look. That’s what happened after the 1929 stock market crash, after all. Regulators stepped in to ensure more transparency—a word that implies the very opposite of “crypto.” South Korea, by the way, happens to be the country where most cryptocurrency transactions occur. The more popular and volatile cryptocurrencies become, the more they will be regulated and restricted. In Europe, concerned authorities have already demanded more assurances for consumers—or cryptocurrency investors. Suggestions that Bitcoin could even serve as an alternative currency in countries with weak financial systems would not be so out of place if Bitcoin had the kind of stability that could make that possible. Then again, why use Bitcoin when many of those countries—largely in Africa—have billions of real dollars worth of real and tangible gold resources?